All mechanics know the necessity of cleaning car parts in order to carry out their work. There are, however, choices to be made regarding the way in which parts ought to be cleaned: using solvent based parts cleaners or non-solvent based parts cleaners? While solvent based cleaners are known to be effective in engine cleaning, their use is also known to have a detrimental effect on both the environment and worker health. The waste liquid produced by solvent based cleaners can pollute the work area if it is left on the work floor, while dumping it into the sewage system untreated means that hazardous elements are simply added to the water system. Chlorinated solvents, like trichloroethylene, are resistant to environmental degradation, while petroleum hydrocarbons, heavy metals (fluid), heavy oil distillates and detergents all contribute to highly pollutant concoction. Is there a suitable alternative to the use of these chemicals in workshops? Happily, there is. 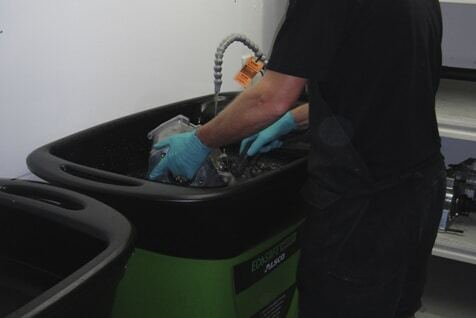 Relatively new to the market are parts washers that are not reliant on solvents. Some of these, such as the Alsco Ecosafe Washer, work using a process called bioremediation – grease and oil are simply turned in to carbon dioxide and water. So, instead of using a product that is harmful to both employee health and the environment, mechanics (and similar industries) can now opt for a product that is as effective (if not more) and eliminates health and environmental concerns. Maintaining a clean, healthy and green environment has become a simpler task for workplaces such as mechanic workshops and garages. Our Alsco Ecosafe Washers are water based and exists in its own environment where oil and grease are transformed into water and carbon dioxide. This is the solution to clean car parts without any risk! CALL ALSCO NOW! You’ve Got Nothing To Lose!